New in stock! Vandalism-proof push-buttons with an unique look and an unbeatable price! 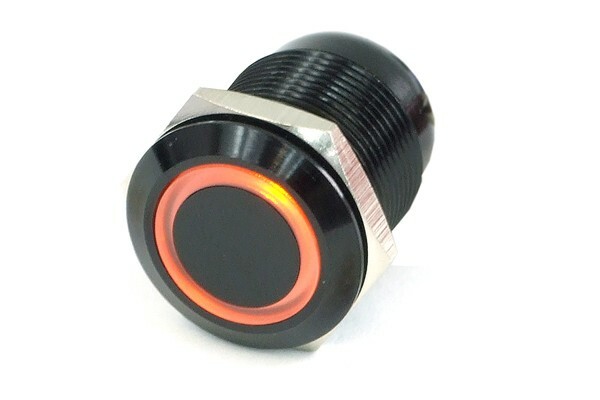 These push-buttons are available in black or silver, with ring or dot lighting in red, blue, white, green, yellow & orange: There's one for everybody's taste! These push-buttons were especially designed and manufactured for 12V operation, therefore no additional resistor is needed. The push-buttons can easily be connected with crimp- or flat connectors with the desired cables. Of course simple soldering is an option as well. The 19mm strong thread can be perfectly fitted into e.g. a computer case. The included counter nut secures the push-button exactly in place and the also included O-ring seal protects the electronic components on the rear end. Therefore the button can also be used outdoors, as it is splash-proof! The area of applications is wide-spread, not only in the computer area, where the button can be used as a reset- or power button or even for switching between different components, but also in most household applications such as a garage opener button or door bell. Other applications include being used as a horn-button in the car or as a button on any Hifi-equipment: The applications are almost unlimited! The technology used and the quality of manufacturing are absolutely outstanding at this price! The moving element seals perfectly with the stationary components. There are no ridges or other remains from the manufacturing process on the button. The lifespan of the mechanical parts is stated to be at least 1 000 000 contacts! The permitted temperature range is from -20°C op to +70°C. The button can be connected to either AC or DC voltage and, of course, the whole button is completely rust-proof. A highlight that no one who enjoys DIY should miss out on!